The colors do not really match others that I was seeing on Ravelry. 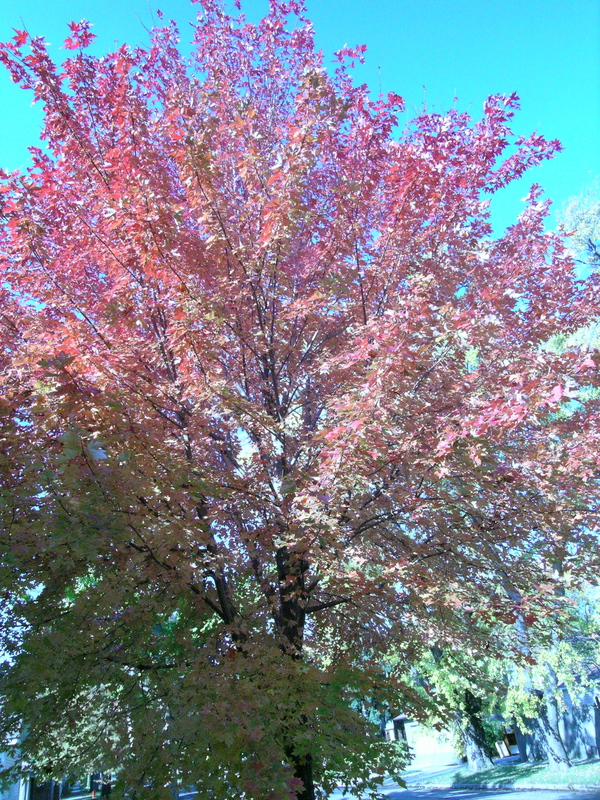 Mine was much bluer, and burgundy instead of a red color in it. 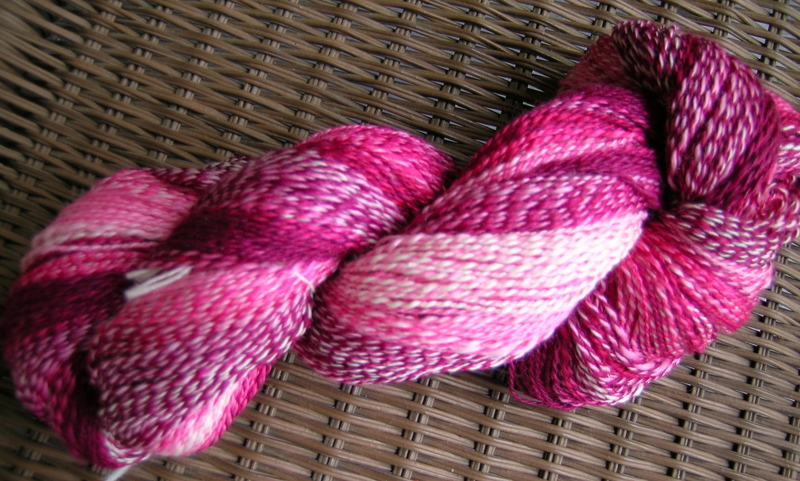 I spun it into a 3 ply. I split the braid into 3 equal lengths. The first 1/3rd was broken into 4 sections, the second 8 sections lengthwise, and the third section into 16 fine sections. 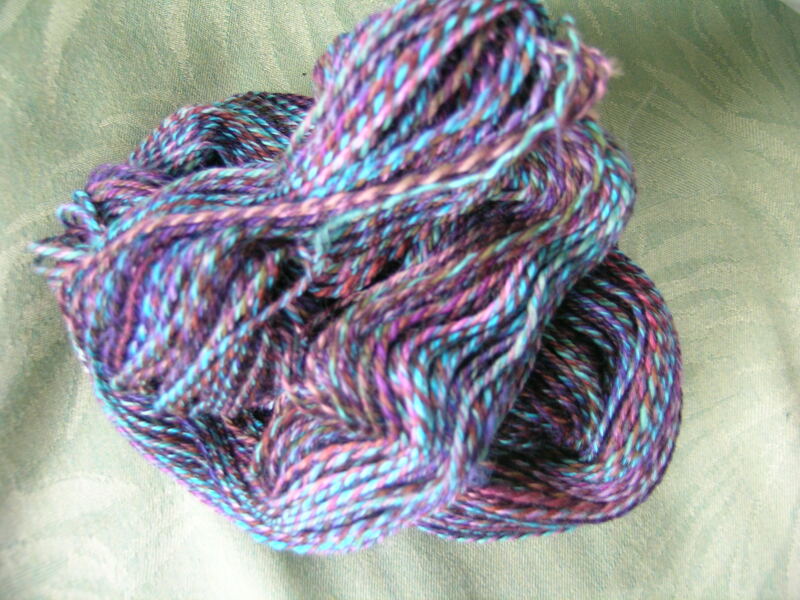 So, this was another attempt at Fractal Spinning, using a more variegated roving. I was okay with it while spinning it up, not really in love. And plying it, I did not like it at all. That seems to be a common occurence with me, I am not sure why. 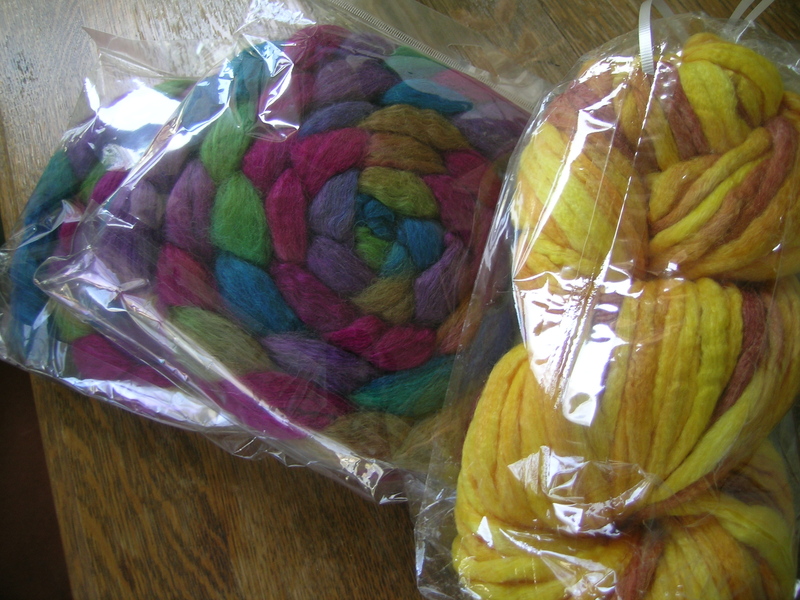 The skein is being washed, here are the pre-wash photos. 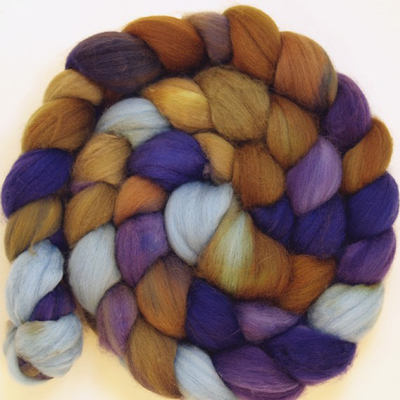 My understanding is that the Polwarth will full out considerably. 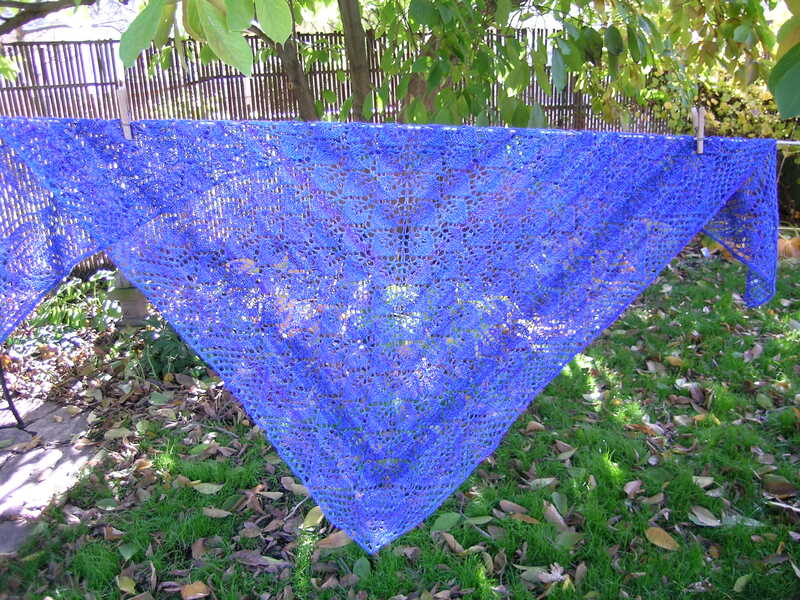 It is okay, but nothing like the others that I saw on Ravelry. I think that they really have some issues with quality control and consistency. 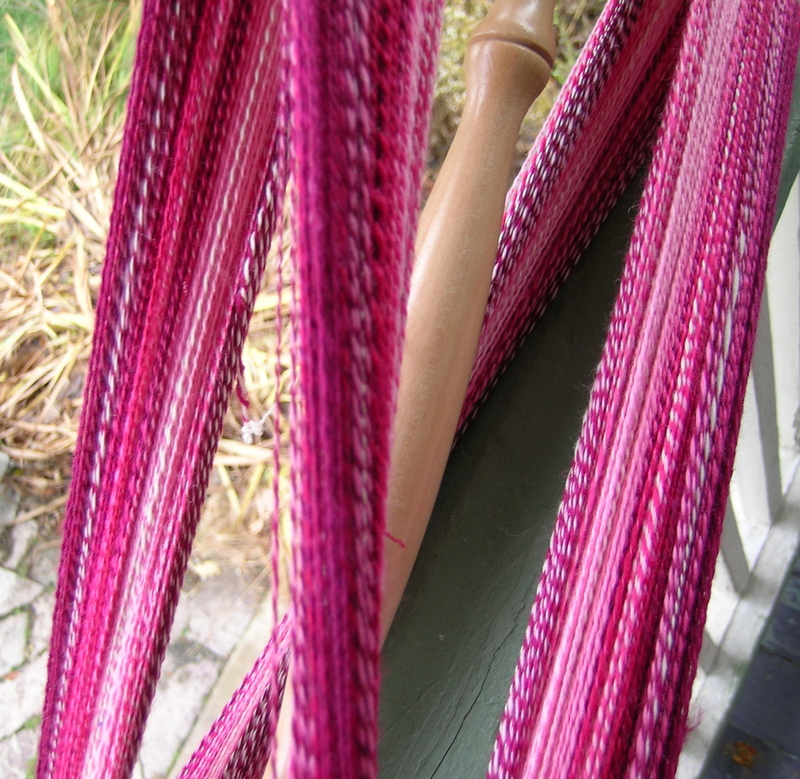 There are 2 different dyers who dye on alternate days, I suspect that the results vary widely. While waiting and waiting for my original 2 rovings, I spun this up. No updates from the vendor unless I asked. After 45 days, I cancelled the order, as PayPal would not back up any problems later than that. They had lots of promises, was supposed to be the end of October, and now it looks like it will be mid-December for those who held out. Needless to say, I will not be ordering from them again. I like how your yarn came out. I hope you can get your money back. Well, it is not really stormy, but very dreary. 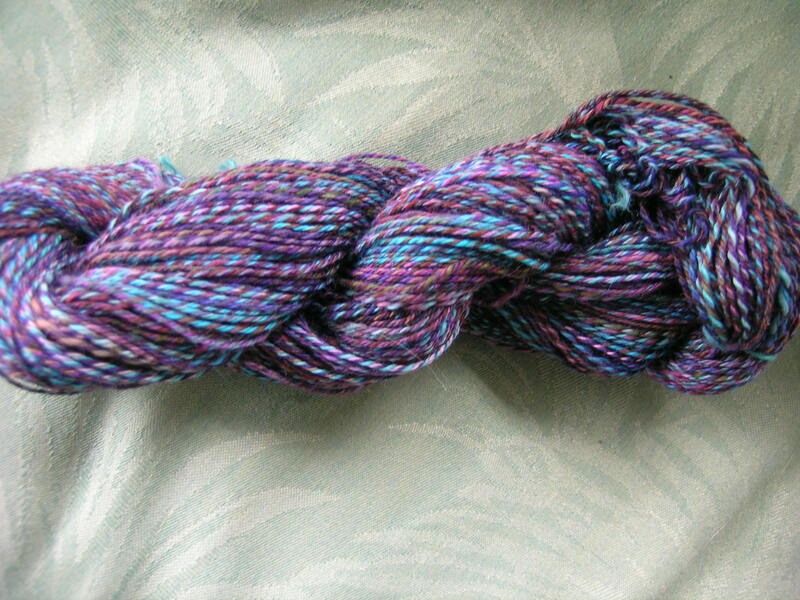 I finished spinning up this fiber last night. 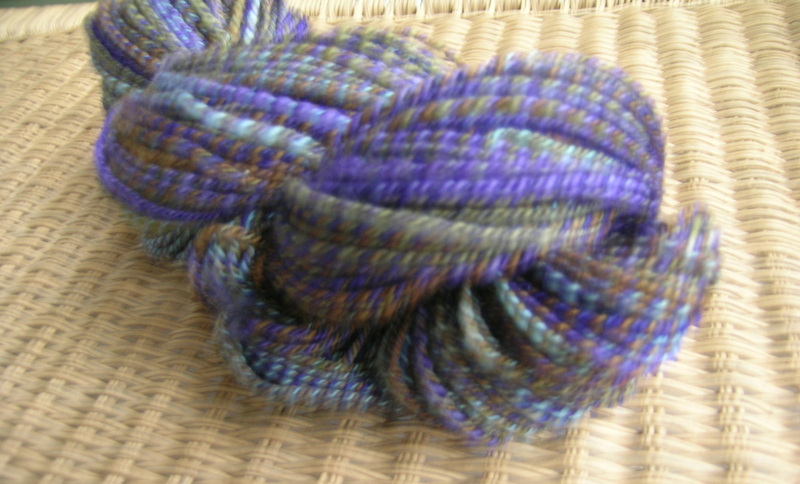 It is from Fiber Optic and called Stormy Monday Blues. 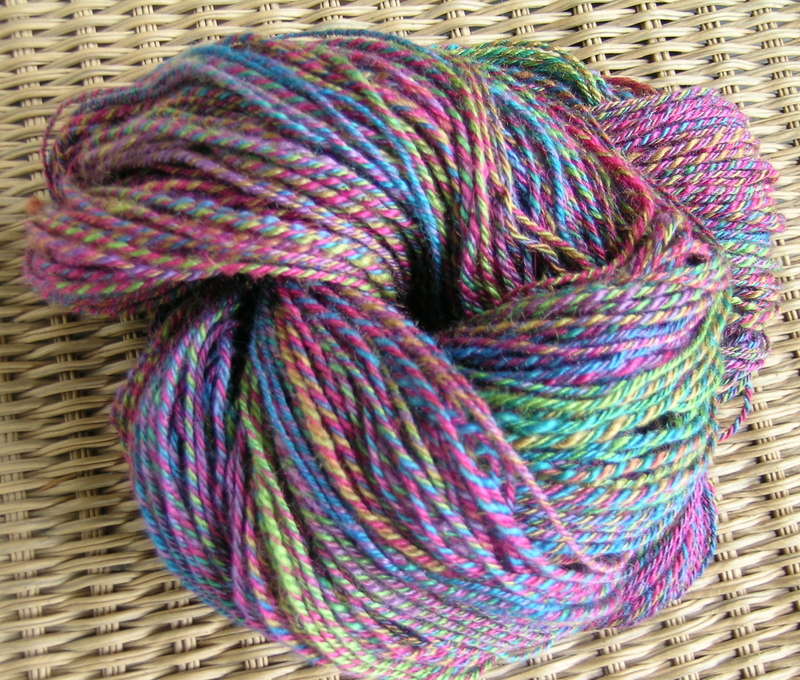 It is 100% Merino, superwash. 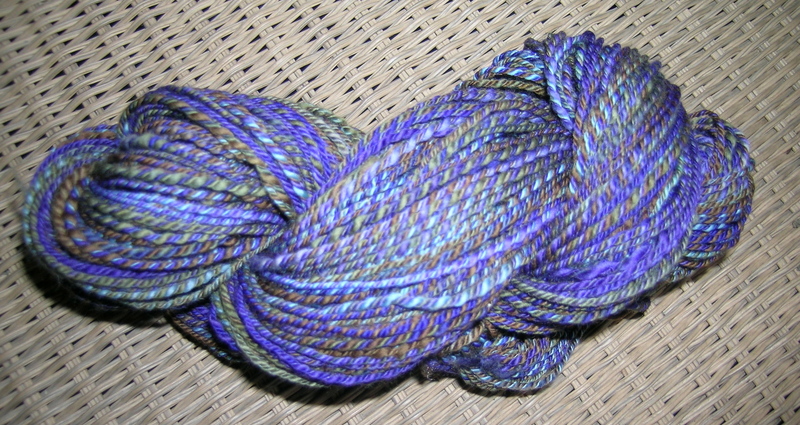 I thought that this would make a great pair of sock, so I spun it as a 3-ply, using fractal spinning again. I was disappointed in my yardage, getting only 248 yards. I find the superwash very hard for me to spin finely. 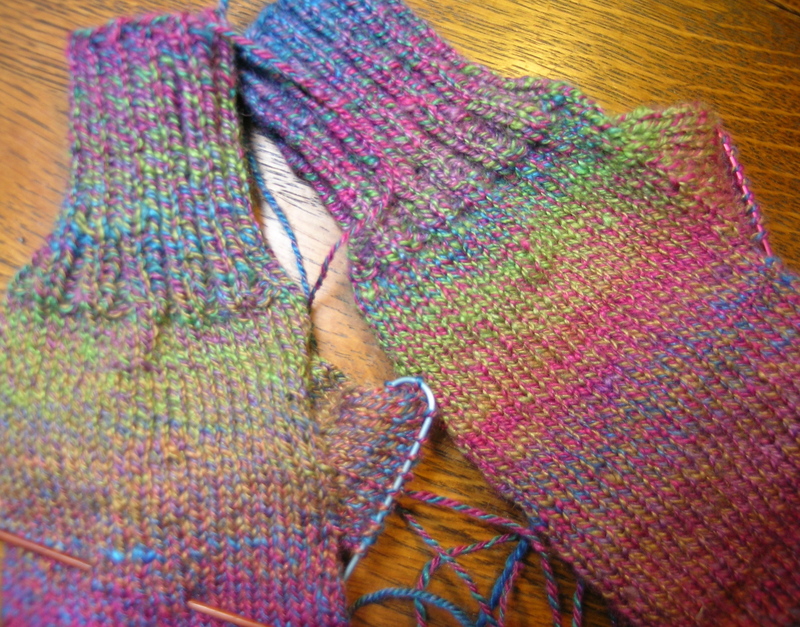 The colors are gorgeous, even though I ended up with a few sections where all 3 colors met for a while. I think that next time I will split the last section of roving down as small as I can. I was hoping to make a pair of socks for my husband. He is the most supportive of my spinning and really gets excited when I show him my newest finished skein. 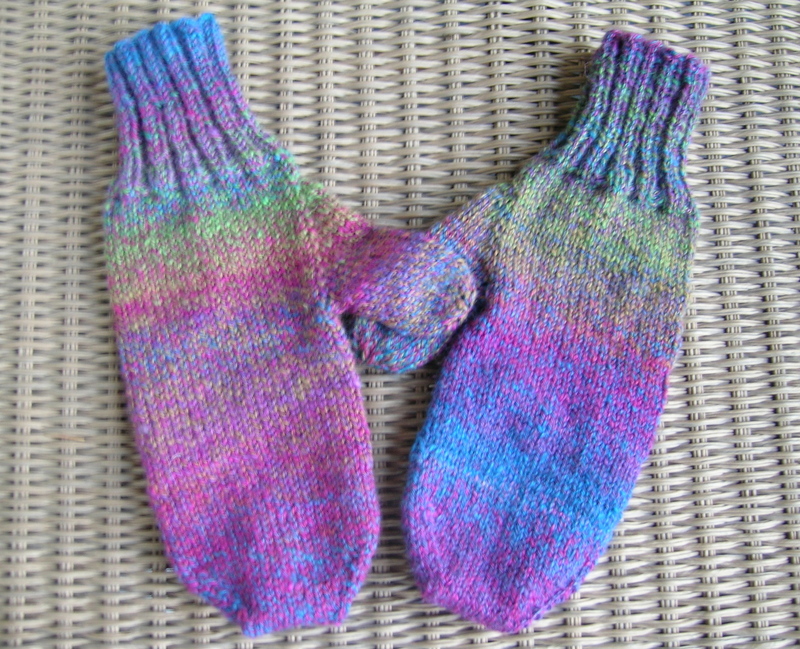 I guess that I will have to pair this with something else and make him some house socks. I made my first attempt at Fractal Spinning. 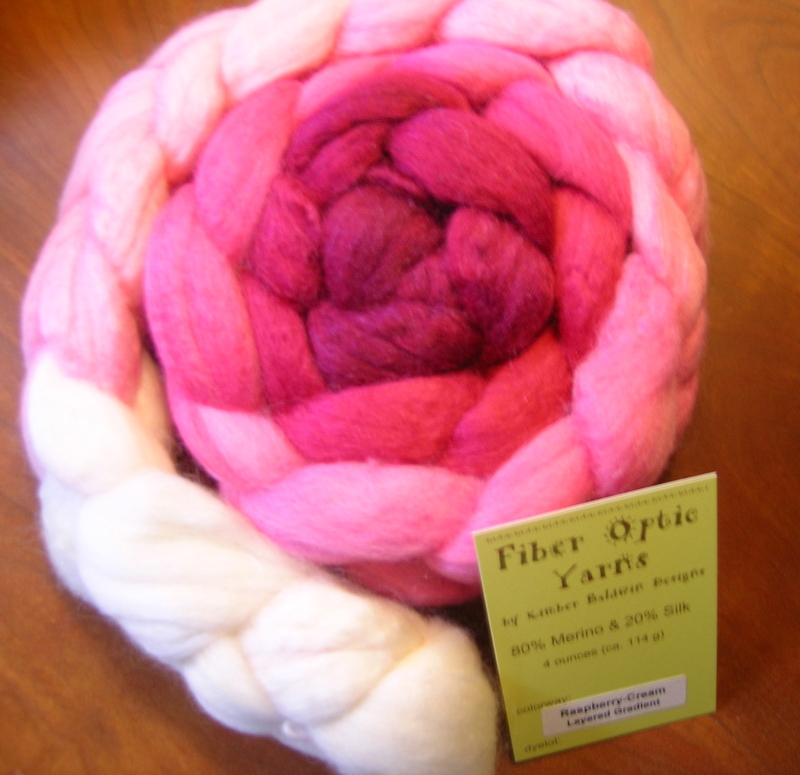 Fractal spinning is used with painted roving where you have long sections of color repeats and do not want to end up with a striped yarn. 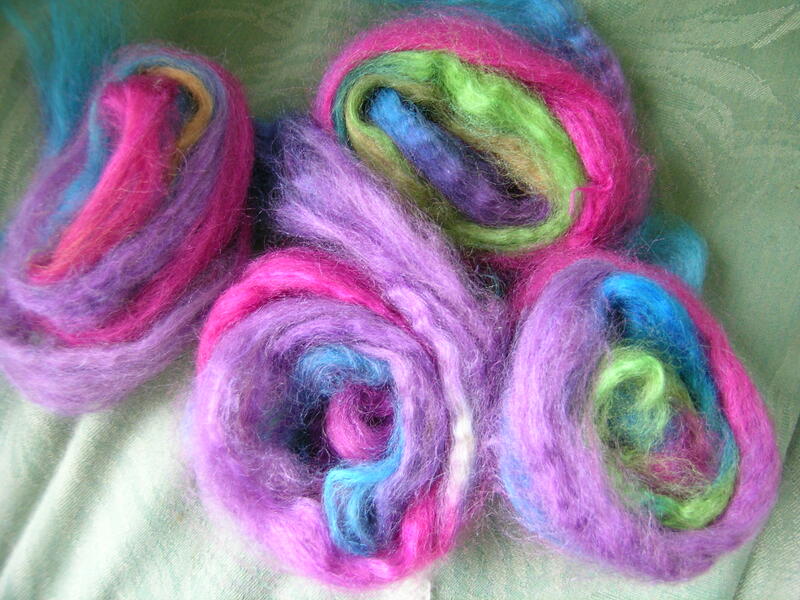 I chose this roving from Fiber Optic, it was the April 2011 fiber club selection, color: Carneval. 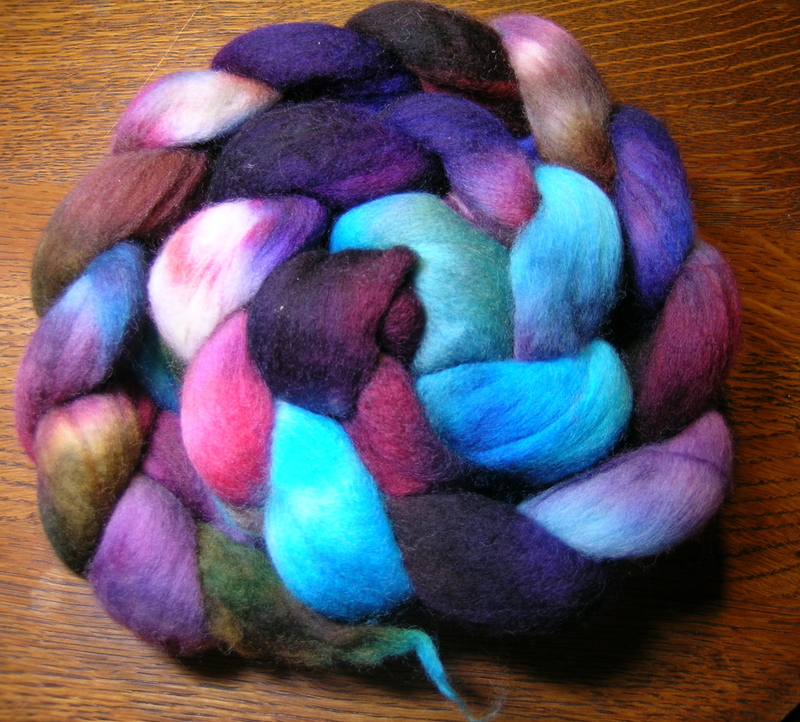 So, I split the roving into 3 equal lengths. 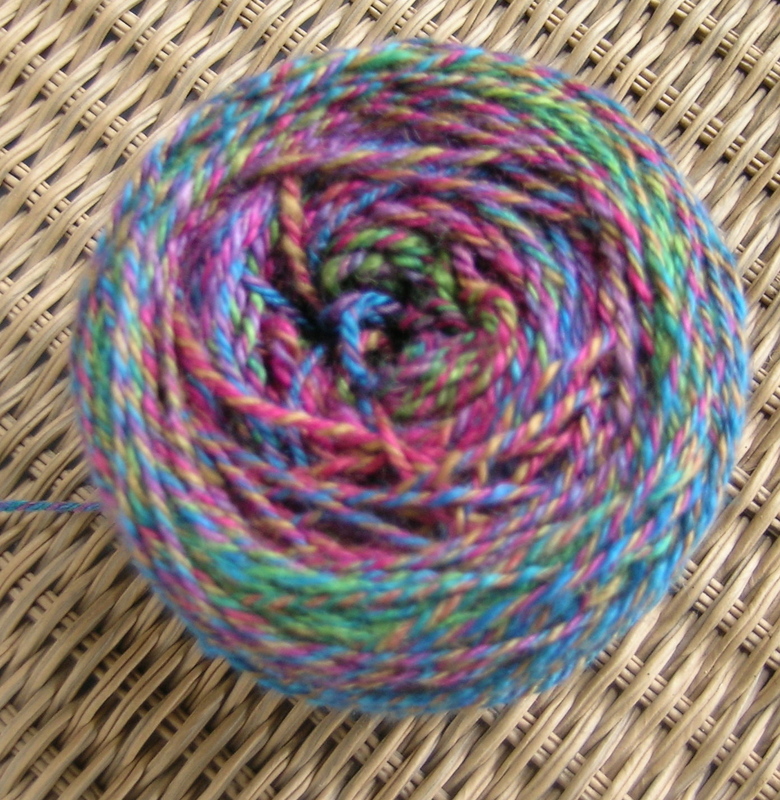 I wanted to make a 3-ply yarn. 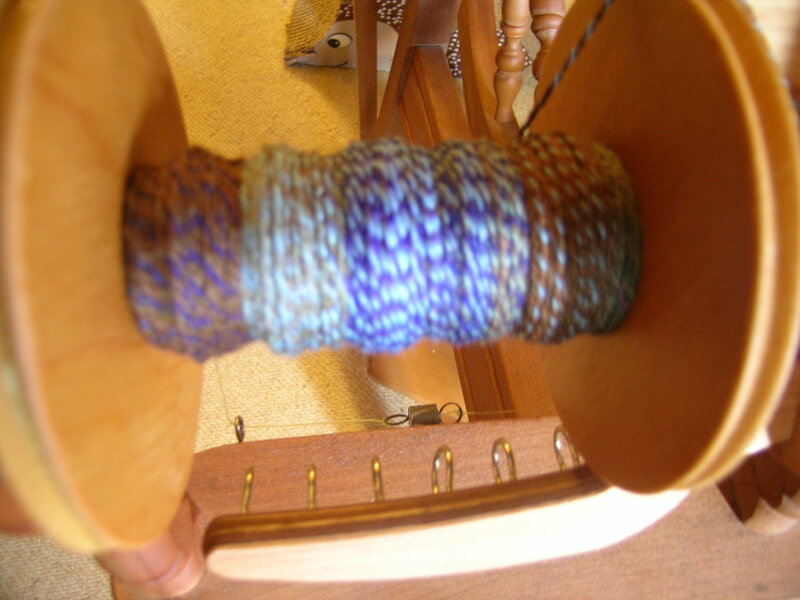 Then I spun the first bobbin with one of the 3 sections straight from the braid with the long color repeats. 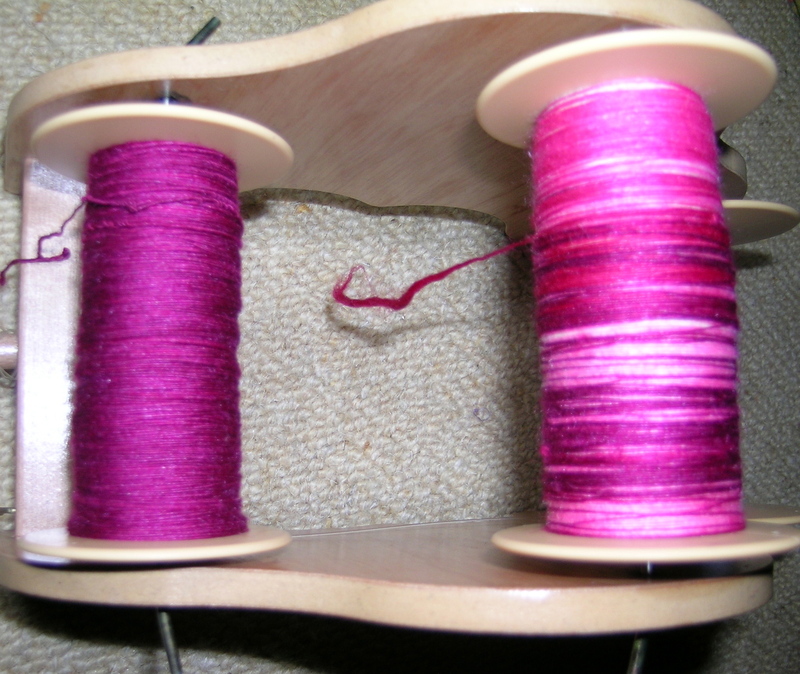 The second bobbin was spun, using a section split down the middle. 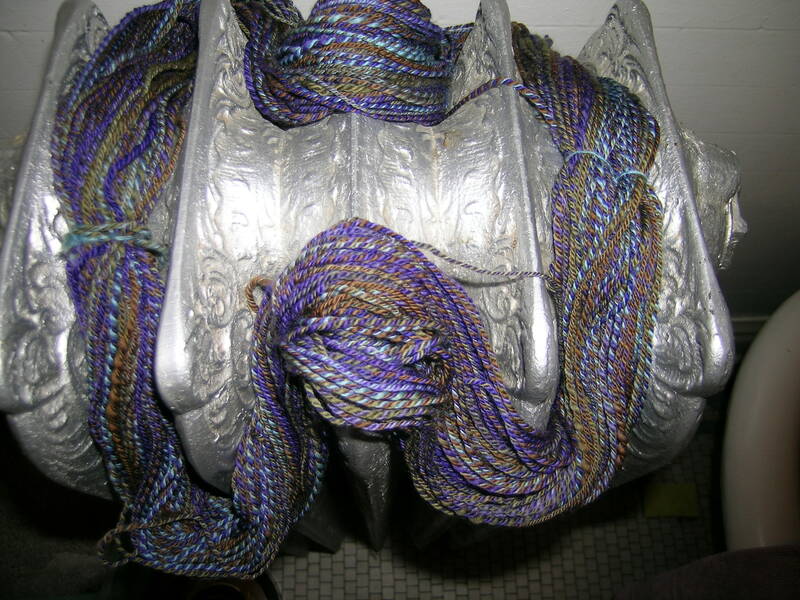 And the last bobbin was spun with the roving spilt into 4 sections. 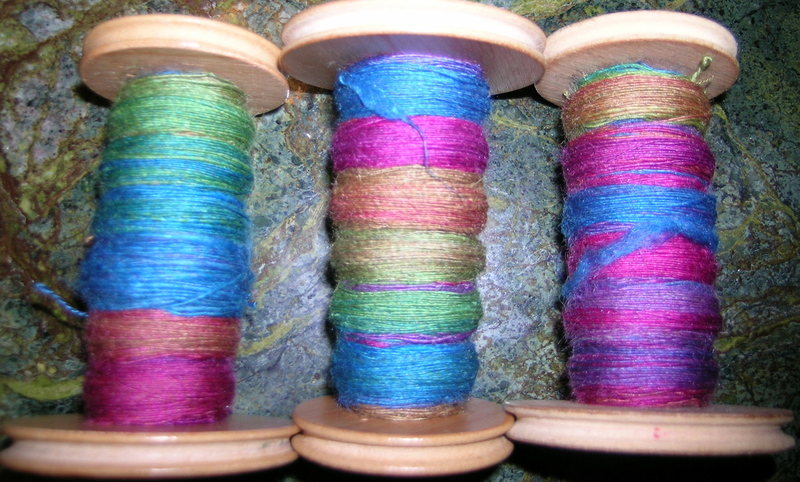 This shows the 3 bobbins after they were all finished. 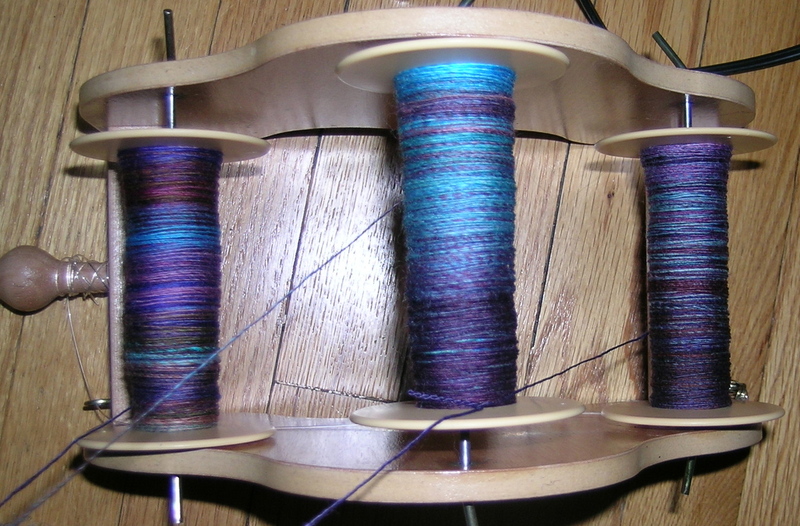 The bobbin on the left is the 1st spun, straight from the roving, the middle is the second (split in half), and the right hand bobbin is the roving split into 4 sections lengthwise. You can clearly see how the color repeats decrease the more the braid is split. 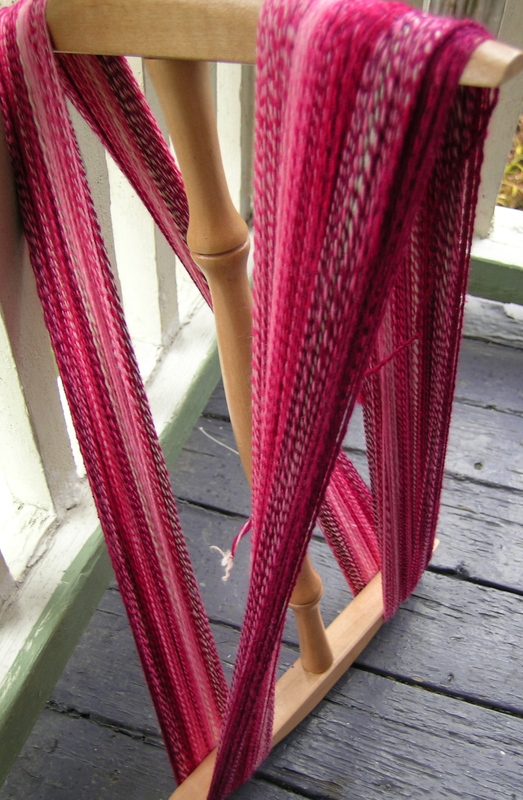 Prior to plying, I rewound each bobbin using my newish LeClerc bobbin winder, then proceeded to make a 3-ply yarn. While I was plying I was not sure of the colors, but I think that they came out very nicely. I am fairly happy with how this turned out. 328 yards of 3 ply with 4 oz. 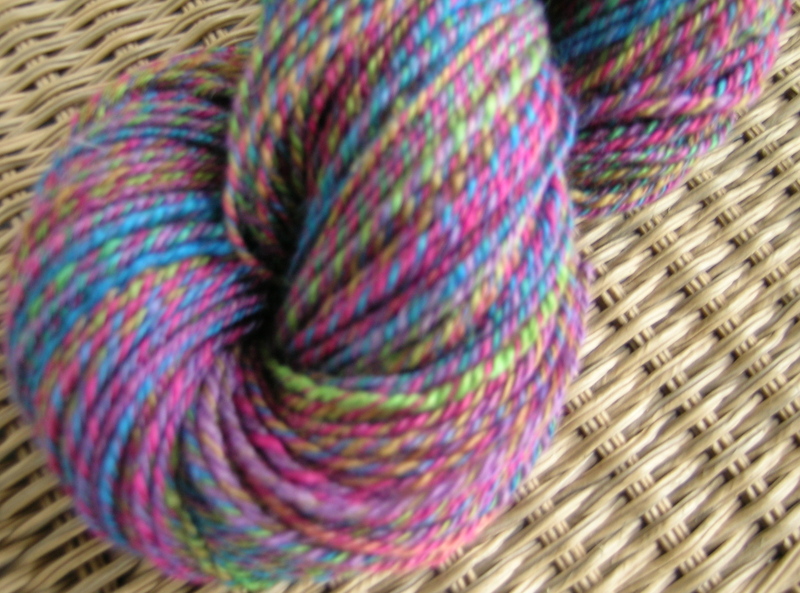 I have one more braid of this to spin up, but first want to see how it knits. 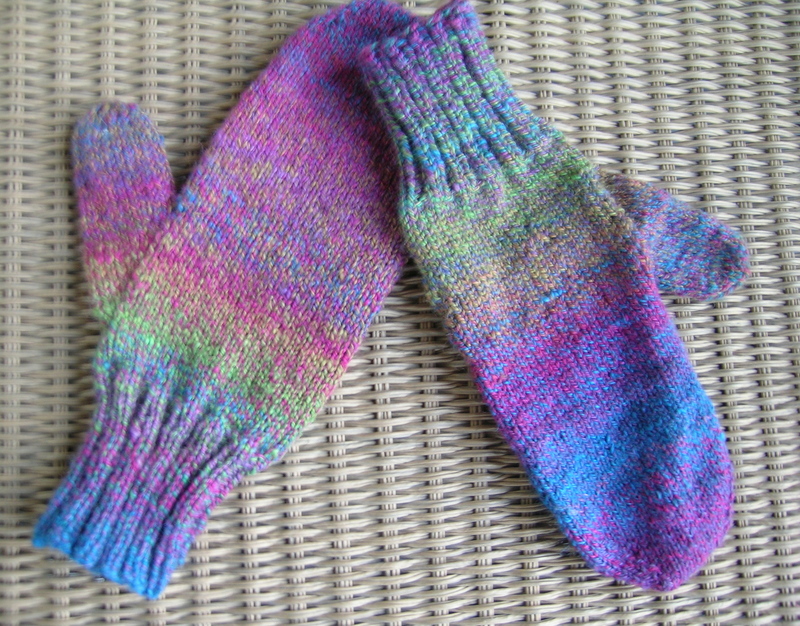 I am thinking a pair of fun, bright mittens. Here is the cake all ready to go. 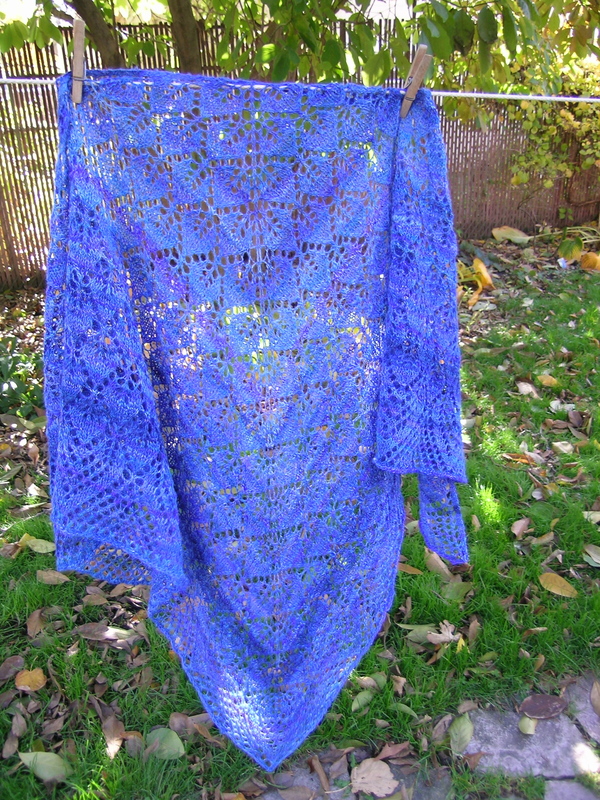 Hopefully I will have some knitting done with this by tomorrow.